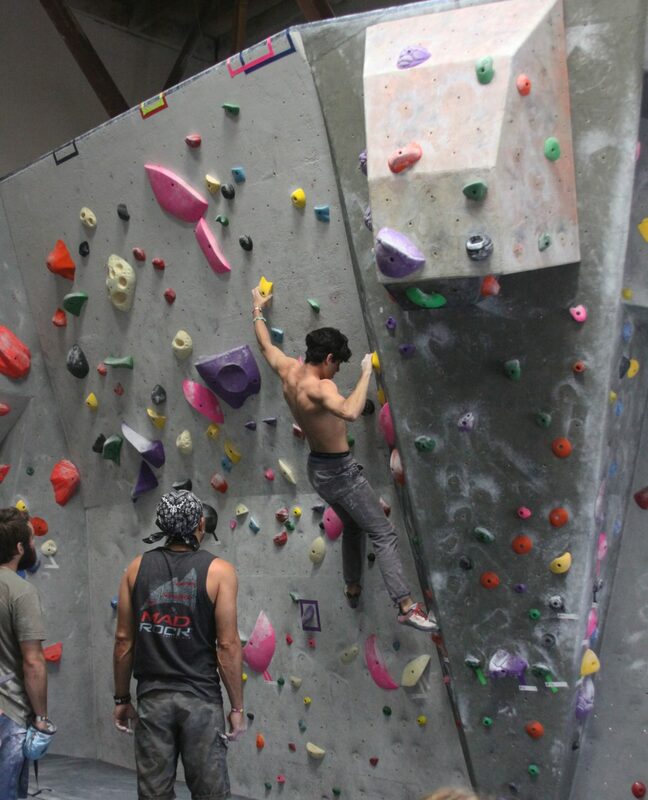 At Aesthetic, over 3500 square feet of terrain make up our featured bouldering facilities. Bouldering is a form of free climbing where the climber uses no ropes to ascend boulders 10-18 feet tall. Our ten distinct features include all competition grade angles and is separated in two sections of wall heights. The first sixty feet contains our sixteen foot tall finish rail divided into three predominate sections, The Wave Feature, a vertical ascent portion, as well as a convex wall known as The Bulge. 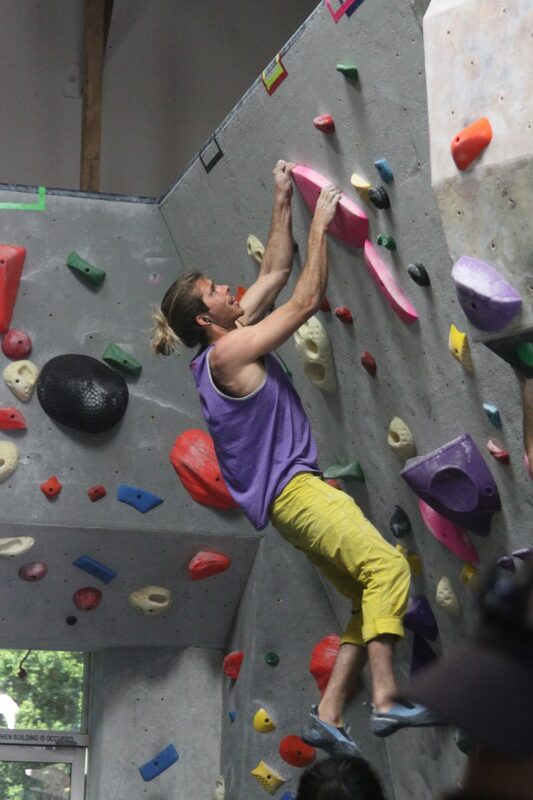 The second portion of our bouldering area rises up to an eighteen-foot top-out boulder. In this area, you will find a sixteen-foot deep cave, featured overhang roof climbing, and our one of a kind 18-foot top out slab! We expanded in the Fall of 2015 by adding an additional 5 bouldering features and a total of 2000 additional square feet of bouldering terrain. Our new expansion area is all finish rail bouldering set at 14 feet tall. The 5 new features include The Steep, The Doorway, The Double Overhang, The Pikes Roof, and The Slab 2.0! 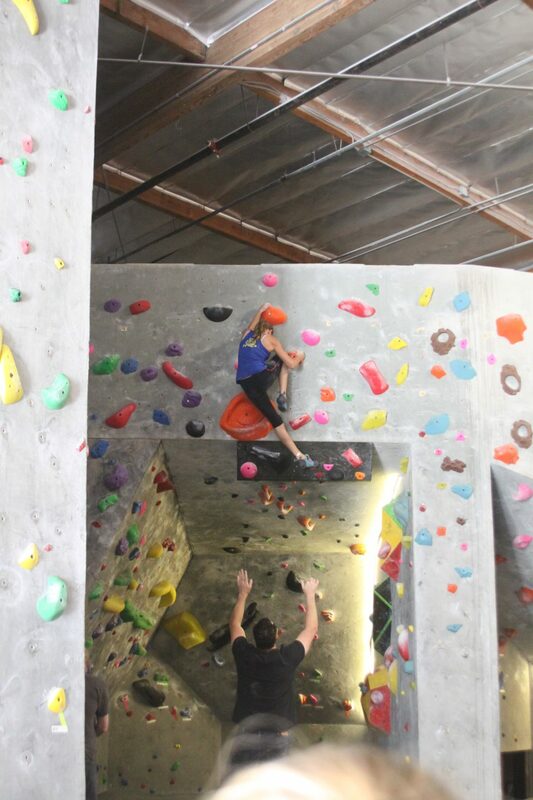 The added variety of climbing terrain makes Aesthetic Climbing Gym one of the top bouldering facilities in all of Southern California! If you’d rather climb with a rope, be sure to check out our top rope area or lead climbing area! 16 feet tall finish rail feature with varying degrees of slab climbing and an overhanging lip for a palm sweating good time! 16 feet tall finish rail feature with varying degrees of overhung climbing and a sustained 45 degree wall to the top finish rail. 18 feet tall top out feature with a unique transition while exiting the overhang onto dead vertical wall. 18 feet tall top out feature that will test your endurance while climbing out of the 16 foot deep cave! 18 feet tall top out feature that is one of a kind is all of Southern California! 14 feet tall finish rail feature with a steep 8 foot face angled at 45 degrees. 14 feet tall finish rail feature where one can practice their stemming abilities and mental focus while conquering the 25 degree overhang above. 14 feet tall finish rail feature with a 20 degree overhang wall meeting a 30 degree overhang. Core tension is key on this feature! 14 feet tall finish rail feature that you swore you saw outside rope climbing. The two tiered roof opens up endless possibilities for stemming and powerful climbing! 14 feet tall finish rail feature that pulled a play out of classic Joshua Tree Slab Climbing. The low angle of this wall allows for hands free climbing allowing you as a climber to really practice your footwork on those glasses smears!